SSR has released their new GT Forged Lug nut! Made of 7075-T6 Cold Forged Aluminum, the spline type Lug nuts are a great match for your SSR wheels or any other set of aftermarket wheels that used a tapered seat. M12 x 1.5mm application: Fits Most Hondas, Acuras, and most Toyotas, etc. M12 x 1.25mm application: Fits Most Subarus, Nissans, etc. If you're unsure of your thread pitch, you're more than welcome to give us a call to verify. Note: These lug nuts are made with tapered seating (60 degrees) specifically for aftermarket wheels. 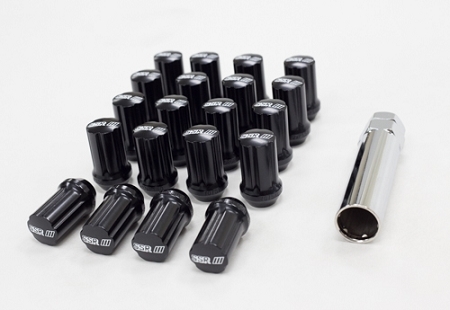 Do not use these tuner lug nuts on your factory equipped wheels. These lug nuts do not fit on special wheels that needs inverted lug nuts. We do not accept returns or exchanges once test fitted or used.